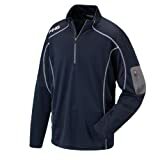 Keep warm and stylish in this 1/4 zip layering piece. Forearm zipper pocket with pass through MP3 cord. Contrast cover stitch and PING heat seal on shoulder. The Backswing PING pullover is lightweight, durable, and has contrasting side panels. It’s a great layering piece and can be worn as an outer layer or under a jacket. The PING logo is on the arm and Mr. Ping is on the back neck. You will look great and be comfortable in this stylish pullover. The Fleece PING pullover is durable, and has a contrasting color design. It’s a great layering piece and can be worn as an outer layer or under a jacket. You will look great and be comfortable in this stylish pullover. 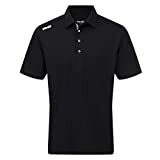 Short Sleeve Dri-FIT Pebble Texture Polo Sport Shirt – High-performance moisture wicking from Dri-FIT fabric keeps you comfortably dry, while a subtle pebble texture adds classic style. PING is the world’s most trusted name in golf apparel. The PING Collection builds upon a heritage of technical excellence, using the finest yarns that add luxury and value to each garment. Their signature polo shirts feature wrinkle resistant, moisture wicking technology that helps you not only play your best, but also look your best. 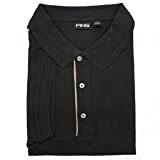 So whether you’re hitting the links for 18-holes, or just want to look stylish on a night out, these PING Polo shirts will help you dress for success. A polo for the game. Updated color block style wth contrast insets on sleeve and forward sideseams. PING embroidery on right sleeve and Mr. PING embroidery at back yoke. 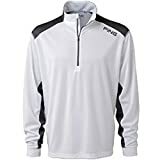 PING Mens Sensor Warm Colorblock Pullover Lightweight Pullover for Cool Weather Games Now, the finest name in golf equipment offers the finest in golf apparel. The PING Collection builds upon a true golf heritage of technical excellence to create a clothing range which reflects a philosophy of innovation, performance, quality, and style. 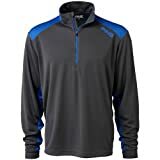 PING Mens Sensor Warm Colorblock Pullover features Lightweight pullover is unlined and great for layering on chilly mornings on the course Four way stretch fabric allows you freer movement during play Self fabric stand up collar and half zip placket helps keep the warmth in Inside storm flap and chin guard Colorblock shoulders and sleeves adds style Long sleeves are pieced for better movement Even bottom hem See the Machine Wash Tumble Dry 100 polyester PING…A Force To Be Reckoned With! Keep confident on and off the course with this stylish golf polo shirts available this Autumn from Ping Collection. With an amazing new range of colours Ping Collection has yet again set itself apart from all its rivals. The Jet polo shirt from Nike features Sensorcool technology which provides you with crease resistance, UV protection and moisture wicking properties. Laid on contrast panel and tape detail to back yoke. Tape detail to inner placket. The colorblocking PING pullover is lightweight and durable. It’s a great layering piece and can be worn as an outer layer or under a jacket. Keep confident on and off the course with this stylish golf polo shirts available this season from Ping Collection. With an amazing new range of colours Ping Collection has yet again set itself apart from all its rivals. The Jet polo shirt from Nike features Sensorcool technology which provides you with crease resistance, UV protection and moisture wicking properties. Finished with the PING logo to the right sleeve. 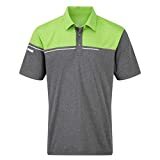 Find more Ping Golf Shirts products on Amazon!